Taking control of your physical and mental health is a must if you want to get the most out of life. Those that thrive in their lives are the ones that take the time to learn about how the mind and body works. They also learn how to train the mind for more calm, clarity and focus. The challenge with the mind is that it tends to live in the past. It draws upon the knowledge and beliefs that you have collected over time that ultimately determine the results you get in your life. Therefor if you are not happy with the results you get in your personal or professional life you’ll need to change the way you think and behave. When your results don’t match what you thought you wanted that’s when you know that you have limiting beliefs and unconscious patterns that are driving your destiny. Whether it’s to lose weight, fall in love, make more money, or even just free your mind from doubt and fear – the secret is what’s going on in your mind. It so easy to get stuck in habitual ways of thinking and behaving which is why so many people aren’t happy with where they are or what they have in life. It’s not that they don’t earn enough money, or they don’t have enough motivation to get unstuck. It’s that their mind is stuck in old patterns of thought. When you are able to clear the mind and focus it on what you really want without it being sabotaged by underlying limiting or negative beliefs then there are no limits to what you can be, do or have. 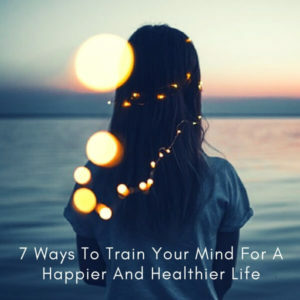 Here’s my top tips for training the mind to focus on more of what can bring you lasting happiness, health and well-being. This starts with your vocabulary because the words you choose to think or speak have the power to influence your outcomes. 1. It’s only a problem if you think it’s a problem. The mind likes to make up problems even if there are none. Most of the time this is just the mind that believes that life is hard and everything is a struggle. The simplest way to change this belief is to tell yourself that there are no problems there are just opportunities to learn and grow. I’ve also change the word ‘problem’ to ‘challenge’ in my vocabulary as the word challenge has a much higher vibration to it. Regardless of what your expectations are, how realistic or unrealistic they are, regardless of how generous or harsh you know the events in your life are… if the events of your life meet your expectations you are happy if the events of your life miss your expectations you’re unhappy it’s as simple as that. When you should on yourself what you really mean is that you don’t want to. Instead of using the word ‘should’ simply change it to ‘could’. So it becomes, “I should go to work today”, to, “I could go to work today”. The word could implies you have a choice whereas should doesn’t. If you want to do something do it. If you don’t – don’t! A lot of people like to use the word ‘can’t’. They can’t do this or they can’t do that for whatever reason. Here’s the thing. Of course you can have it, be it, or do it – if you really wanted to do. Can’t really mean’s won’t or you don’t want to so rather than make excuses just be honest and this will instantly free up your mind. The word ‘shouldn’t’ comes from a place of self-judgment. If you are telling yourself that you shouldn’t be doing something then it probably means that you want to but you feel guilty about it. Instead, have a go at dropping the guilt and give yourself permission to do what’s true for you. You never know, you might be so glad you did! 6. Choose it or lose it. We all have the power to choose our reality from moment to moment – or do we? When you believe that your power of choice had been taken from you then in that moment you become a victim of circumstance. When that happens, then you are saying to yourself that you are powerless. To take back your power simply speak the words, “I choose… (insert blank)”, and stand tall in your truth. Other’s may not like the choices you make but that’s their issue not yours. This is of course one of the most powerful ways to train the mind for happiness and health. When the mind stops thinking, even for just a moment, it creates instant clarity and calm. Peace of mind always happens when the mind lets go. The rest of the time it’s in a state of ‘doing’ or busyness which takes it’s toll on you and your life. The best way to empty the mind is to learn to meditate. Meditation is the key to unwinding the mind and resetting it so that you have all the mind power, focus, and energy you need to enjoy a happier, healthier quality of life.